The challenge of converting salt water into drinking water is one that has been testing scientists for quite some time, but with our supplies of fresh drinking water starting to dwindle, a solution to this problem is becoming ever more necessary. Our water supplies are under threat from a range of sources including pollution and the destruction of ecosystems, meaning that fresh drinking water is becoming more and more scarce. Combine that with the fact that the demand for fresh drinking water is growing rapidly and we’re looking at a potentially worrying situation. In the US, the need for fresh drinking water is already outstripping supply. It’s predicted that within three years, up to 36 US states will have a serious shortfall of fresh drinking water. By 2020, the UN estimates that up to 14% of the world’s population will experience water shortages. This all means that it’s never been more important to look at innovative ways to obtain more drinking water globally. Desalination, the process of converting salt water to drinking water by the removal of the salt content, has been used for many years and is an efficient technique but the process certainly needs some improvements to make it more widely accessible. Whilst we currently do have a range of techniques to desalinate seawater, these are often very expensive or use a large amount of energy during the process. Two popular techniques to remove salt from water are distillation and reserve osmosis. Distillation involves boiling the water to separate the water from minerals. Once the water has been boiled, the water vapor, or steam, is then condensed to produce fresh water. Distillation is effective, but requires a lot of energy in order to heat up large quantities of water. Desalination plants are often built next to power plants, so the waste heat from the power plant can be used to help heat up the salt water. Reserve osmosis desalination requires less energy than distillation, and works by forcing the water through very fine filters, which removes all salts, other minerals and biological compounds. The energy requirements for this technique are needed to pressurize the water to allow it to be forced through the membrane or filter. Using this technique, a small amount of salt does pass through the membrane, but this technique is now more popular than distillation due to its lower energy requirements. The majority of desalination plants are industrial in size but desalination can also be used on a much smaller scale as well. Water makers are frequently found on small yachts and ships in order to allow sailors to have access to clean drinking water whilst on long voyages and without having to rely on filling up their water tanks aboard when they go ashore. Some countries including Saudi Arabia and the United Arab Emirates rely on desalination heavily. Each year, Saudi Arabia produces 1.3 billion cubic metres of water in its desalination plants and produces 70% of its drinking water using this method. Desalination is a viable technique for meeting our growing water demands and can purify both seawater and brackish groundwater. The problem is that the process is currently very expensive which means that in order for it to become more affordable and therefore accessible, the technology requires some refinements in order to be able to help us meet our growing requirements for fresh water. 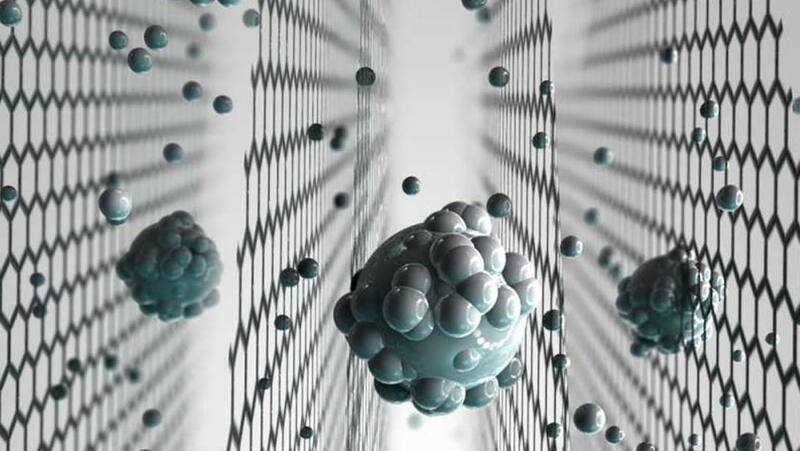 In order to start trying to meet this new demand, a team at Manchester University has come up with a novel new method of desalination, using a graphene sieve. The use of graphene oxide membranes has been used previously to filter out larger salts, however the challenge is that the membranes have never been small enough to remove the more common, smaller salts found in saltwater. When submerged in water, these membranes have had a tendency to swell in size, which has meant that the size of the pores increases; allowing salt molecules to pass through the sieve as well as the water molecules. The team from Manchester University have now improved the graphene sieves further, in order to prevent the membrane swelling whilst also being able to control the pore size of the membrane. The pore size was controlled through the use of physical confinement. To achieve this, the graphene oxide was embedded in Stycast epoxy, which effectively restricts the graphene oxide swelling when it comes into contact with water thus removing the problem of salt being able to permeate and move through the membrane. The team hope that their method can be further refined and could be used to provide small-scale systems for countries without the infrastructure to build large traditional desalination plants with their high associated costs. The enormous potential of these sieves to provide an accessible and affordable method of desalination to countries and communities which may not have been able to afford current technology is an exciting step forward in our quest for those precious drops of water to drink.